Reformed Church of North Orange. In the spring of 1883 the congregation called Rev. L. Dykstra as their pastor. Rev. Dykstra accepted the call and was installed as the first pastor of the Reformed Church of North Orange in September, 1883. 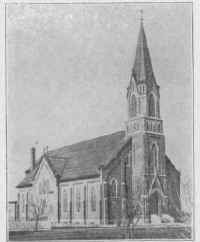 In 1884 the name North Orange was changed to Newkirk, from that date it has been the First Reformed Church of Newkirk, Iowa. The congregation built a parsonage in the summer of 1883 and in 1884 an addition was added and barns were built for the horses of the church members that had to come to church with teams, the distance to drive being from one to six miles. In 1884 it was necessary to provide more church room to accommodate the people in attendance, so an addition of 24 x 36, 14 feet high, was built to the church. In December, 1886, Rev. L. Dykstra accepted a call to Albany, New York. In the spring of 1888 the theological student, A. Van de Berg, was called by the church, which call he accepted. He was installed as the pastor in August, 1888. In 1889-90 the membership had increased so that again it became necessary to provide more church room and in the early spring of 1891 the church members decided to build an entire new church and keep part of the old church for consistory room. Work on the new church was begun at once, and the church was finished before the fall of 1891. In the summer of 1892, Rev. A. Van de Berg accepted a call extended to him by the Reformed Church of Overisel, Michigan. In the spring of 1893 the church members extended a call to Rev. J. M. Lumkes, which he accepted and was installed as pastor in July, 1893. In 1898 the congregation sold the old parsonage and built a new one. When this was finished the property of the Newkirk congregation was worth as follows: Church $10,000; parsonage $2,000; barns, etc. $2,000; total $14,000. In the spring of 1900 Rev. Lumkes accepted a call to the Reformed Church of Alto, Wisconsin, and then the church members called Rev. A. M. Van Duine, of Holland, Nebraska. He accepted the call and was installed as the fourth pastor of the church August, 1900. In 1904 Rev. A. M. Van Duine accepted a call to the Reformed Church or Alton, Iowa, and the members of the Newkirk Church called Rev. Heemstra from the Central Reformed Church of Sioux Center, which was accepted by him and he was installed as the fifth pastor. Rev. J. F. Heemstra accepted a call as principal of the Northwestern Classical Academy of Orange City, Iowa, and the members of the church extended a call to Rev. H. P. Schuuman of Leota, Minnesota, which was accepted and was installed as the sixth pastor of the Newkirk Church, November, 1906, he being our pastor at the present time, working in this part of the Lord's vineyard very successfully. The congregation at present numbers 110 families and has a membership of 220 now in communion, in the catechumens classis number a total enrollment of 165 and the Sunday School now has a total number of 225, so the present church is again too small and the congregation decided to make such improvements as to make seating capacity for 165 more people, which work is now being done by contractor G. Beyer of Boyden, Iowa, with his force of helpers. The present improvements will cost in the neighborhood of $6,000, and will seat 550 persons when finished. When this work is done the Newkirk congregation will have their church property free of debt with the future outlook very promising. Through the influence of Peter Gehlen, at that time a resident of Jackson County, seventeen men, some single and some married, left Jackson County on the 2nd day of May, 1870, with eighteen prairie schooners; drawn by oxen. It took eighteen days to cover that distance, thus landing in Sioux County May 19th, 1870. W e came via Waterloo, Fort Dodge, Storm Lake and Cherokee. The names of this original colony and as near as I can remember, where they settled, are as follows. Franz Hansen homesteaded on section 18, East Orange. P. and N. Ginsbach on section 34, Nassau. Peter and Henry Frantzen, section 26, Nassau. Michael Konz and Mike Biever, section 24, Nassau. Peter Wagner, Peter Gehlen, Theo. Gehlen, Nic Nemmers and Frank Arens on section 5, East Orange. Math Harens, section 26, Floyd. Peter Ney, John Perlot, Henry Remacle and Peter and John Christiany all settled in Floyd Township. Other early settlers in the German Catholic Colony were Nic and Matt Probst, who homesteaded on section 18, East Orange. Nicholas Kellen, father of Math, John, Peter and Camellus Kellen, now prominent settlers In this community. Joe Krebs, Jacob, Theodore and Nicholas Klein, John and Nicholas Schneider, H. and P. Goebel, J. and G. Gerst, N. and P. Schaul, N. and J. Henrich, M. Streff, M. Schroeder, N. Koob, Michael Haupert, Joe Budde and others the writer cannot remember. Homesteads were all gone in and around Alton in 1871. Railroad land, while the homesteads lasted, sold at $1.25 per acre. The grasshopper raid came in 1873 and they were with us for several seasons. Some years all the crop was destroyed, others only a part. These were truly years of discouragement. All of us, no doubt, would have left if we had had enough means to get away, but as it was we had to stay, which after all proved a blessing to us all as this has surely become a garden spot. East Orange and Nassau were originally one township called Nassau, but in 1875 East Orange became a separate organization by an act of the Board of Supervisors in 1875. When organized there were only enough voters, so every one could get an office. Granville was platted in 1882, when the Chicago & Northwestern Railroad was built through this part of the state. Among the first to locate here and build homes were Jacob Fisch, Peter Galles and others. At first the postoffice was called Ricker, F. W. Ricker being the first postmaster. In a short time the name was changed to Granville. The first store was kept by Ricker Bros. First hotel was kept by Leonard Hill; he was succeeded by Peter Galles. Second store started by Gerlach and Blaesser. Independent District of Granville was organized in 1889. J. P. Schwebach, Nicholas Didier and Mathias Kerper were the first directors, M. Kerper acting as President and Didier as Secretary. N. H. Graff was appointed Treasurer. A new building was built in 1895. Present school board: H. Rickers, President; Geo. Schmidt, P. H. Krohnke and Henry Bunkers, Directors; P. B. Vosburg, Treasurer; N. H. Graff, Secretary. INCORPORATION or GRANVILLE.-The town was incorporated in 1891. An election was held July 14th, 1891, when the following officers were elected: Mayor, P. H. Krohnke; Recorder, N. H. Graff; Treasurer, Henry Ricker; Trustees, Joseph Oberman, Mathias Kellen, J. W. Nield, Casper Goepel, Dominick Berg and J. P. Schwebach. Since that time the following Mayors have served: P. H. Krohnke, 1891-1896; P. B. Vosburg, 1896-1897; J. P. Klassen, 1897-1900; J. P. Fischback, 1900-1902; Nicholas Didier, 1902-1904; J. H. Kramer, 1904-1906. The present officers are: J. H. Nelle, Mayor; N. H. Graff, Recorder; E. U. Thomas, Treasurer; Council, George Schmidt, Joseph Oberman, B. J. Diers, John Schemmel, N, C. Martin and Anton Neuroth. BUSINESS AND PROFESSIONAL MEN.-Bank of Granville was organized in 1887 by Theo. Graff and H. Ricker, with N. H. Graff as cashier. In 1889 the firm was dissolved, being succeeded by Ricker Bros., Henry Ricker, cashier. After the change in 1889, Theo. and N. H. Graff organized the Exchange Bank, the firm name being Theo. Graff and Son. This continued until 1897, when Theo. Graff retired from business, when it was reorganized as Graff Bros., when N. H. and H. C, Graff succeeded to tie business. Both banks now have new buildings that are a credit not only to the town of Granville, but northwest Iowa. GENERAL MERCHANDISE.-Beck and Schwebech, Joseph Nemmers, (successor to Fischbach and Nemmers); J. L. Wieskercher and Co., firm composed of J. L. Wieskercher and Herman Ahlers. These stores carry as good stock as any in northwest Iowa. HARDWARE AND AGRICULTURAL IMPLEMENTS.-P. H. Krohnke. AGRICULTURAL IMPLEMENTS AND LIVERY.-F. W. Ebel. JEWELER AND PHOTOGRAPHER.--N. C. Martin. SHOES.-Peter Misch. BLACKSMITHS.--Schumacher and Goergen. ELEVATORS.-Cannon, Haase & Metcalf, J. H. Hinz. DRY GOODS AND MILLINERY.-Mrs. C. Wiltgen. MILLINERY.-Mrs. B. J. Diers. LIVERY.-J. H. Bussamas. CEMENT BLOCK FACTORY, Graff Bros., owners.-They manufacture building blocks of all kinds, well curb cement, brick, etc. This is the largest factory of this kind in Sioux County. The following have served as postmasters: F. W. Ricker, J. P. Schwebach, John H. Downing, Carl Gerlach, L. S. Stahl, Jacob Fisch, Mrs. L. S. Stahl, Carl Wagner, P. B. Vosburg and Jacob Fisch, the present incumbent. GRANVILLE GAZETTE.-Ably edited by Mr. Flint. SALOON PROPRIETORS-Peter Galles, John Eulberg, Dom Berg and Henry Schemmel. BARBERS-Chas. Hall and Frank Van Bergen. DOCTORS-B. A. Bowers, M. D., and B. T. Suley, Vet. Surgeon. WATER WORKS-Built in 1.896, capacity 18,000 gallons, gives the town the best of fire protection. HISTORY OF THE ST. JOSEPH'S PARISH, GRANVILLE, IOWA. Some years after the Chicago & Northwestern R. R. Co. built its east and west line through Sioux County, locating the station of Granville, and thus opening up the Chicago markets, sturdy men of different nationalities and creeds flocked thither to earn their bread by the sweat of their brows. In a few years the earnest labor of these pioneers drained the morass and made the wilderness rejoice and blossom as the rose. Among these early settlers were staunch Catholics, who, though willing to leave father and mother and brother and sister, to seek their fortune, would not give up their worship of God learned at their mother's knee. Not having any place of worship in their own town, for several years they were forced to go miles over these wild prairies to attend the devotions at neighboring churches. In 1886, however, the catholics of Granville and vicinity, numbering about 70 families, resolved to build a church of their own, which was completed the following year, but owing to the lack of priests this edifice served but as a meeting place, where the faithful would assemble on Sunday to thank the Almighty for His benefits, and to encourage one another in the hardships of pioneer life. But early in the spring of 1888, much to the joy of all, Rev. M. W. McCarthy arrived, and the 25th day of March, on Palm Sunday, the Holy Sacrifice of the Mass was offered for the first time in this village. Father McCarthy proved an energetic man, and set to work at once to build a parochial residence. With this barely completed, he undertook a greater task. Recognizing the deficiency of education without religion, which only aims at training the intellect, leaving the other faculty of the soul-the will-undeveloped, he undertook the building of a parochial school. In December of the same year, school was opened with about fifty pupils, Sisters Rose and Johanna being the teachers. In October, 1890, Father McCarthy was removed to Ossian, Iowa, and Rev. P. A. Tierny of that place was given the charge in Granville. In April, 1895, Rev. John Anler succeeded Father Tierny, who, in January, 1898, was succeeded by Rev. J. H. Stromberg. A new era for the St. Joseph's Parish of Granville began in October, 1902, when the Rt. Rev. Bishop Garrigan appointed Rev. J. A. Gerleman to succeed Father Stromberg. During the past years the parish had grown from 70 to 160 families; the old church building could no longer accommodate the increase, and something must be done. The condition of the old church would hardly permit an addition, so plans were immediately begun for a new one. The contract was let in August, 1903, and work was begun immediately. In May. 1904, the corner-stone was laid with the Rt. Rev. Bishop Garrigan officiating. The outer structure was completed during the summer, but not until September, 1905, was it entirely completed, when it was dedicated by His Grace, the Right Reverend Bishop. ST. JOSEPH CATHOLIC CHURCH, GRANVILLE. The new edifice is 147 feet long, 66 feet wide, with a tower 130 feet high. It is built of the best hydraulic-pressed brick, with stone trimmings, at a total cost of $41,000. It is an elegant church, the finest in the county, and second to none in the northwest; a building of which the members of St. Joseph Parish and their pastor can rightly be proud. The work of building the new church, together with the spiritual care of his parishoners, proved to be too much for Father Gerleman, and in August, 1905, he was given Rev. August Meyer as an assistant. Father Meyer was succeeded, July 1, 1906, by Rev. E. C. Meyers. Father Gerleman also remodeled the old school building, making out of it the parochial residence. A part of the old church building is now used for a school, where 198 pupils are enrolled. A new school building is at present contemplated, and probably before these lines are submitted to the public, this work will have been begun. Henry Hollenbeck and August Dahlman built the first houses in what is now Lynn Township; Mr. H. Hollenbeck building on Section 11 and Mr. Dahlman on Section 15, where Mr. Schultz now lives, Frank Hollenbeck on Section 24, August Stabenow on Section 15 and Frank Williams on Section 9, now owned by Mr. Boerhave, Wilmer Ess on Section 14, now owned by a Mr. Hentges, and Wm. Walker on Section 6. Mr. Dahlman and Mr. Henry Hollenbeck had come from Germany to Wisconsin in 1871, and to Sioux County in 1877, and were the first to settle in Lynn township. Both are now dead, Mr. Dahlman dying in the spring of 1881, and was buried on Section 15, near the place where he had built his house. The reason of his being buried there was that the snow was ten feet deep in places and the body could not be taken to Sheldon, the nearest cemetery, for burial. The first child born in Lynn Township was Sadie Schultz, daughter of Wm. Schultz, who married the widow of August Dahlman.